Love salmon? Or maybe you don't? You just might now! These salmon patties are crisp on the outside, soft (but not soggy) on the inside, and absolutely scrumptious! Especially when served with our favorite sauce — lemon sour cream. Although many salmon pattie recipes call for breadcrumbs or flour… what if you need gluten-free or grain-free? For gluten-free patties, I use sprouted brown rice flour instead of breadcrumbs. When I need grain-free, I use coconut flour. Voila, wonderful patties no matter what! Made with coconut flour, these patties are a Trim Healthy Mama S.
These salmon patties are crisp on the outside, soft (but not soggy) on the inside, and absolutely scrumptious! 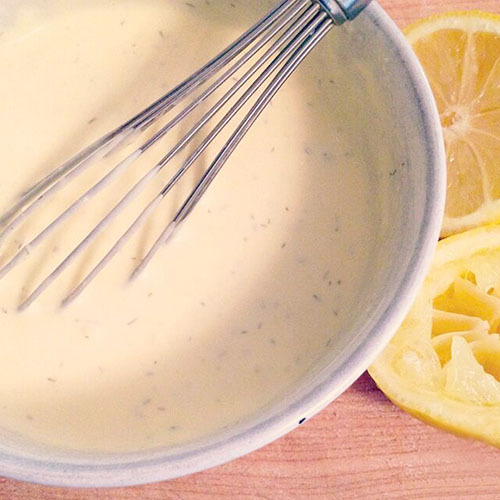 Especially when served with our favorite sauce — lemon sour cream. Although many salmon pattie recipes call for breadcrumbs or flour… what if you need gluten-free or grain-free? For gluten-free patties, I use sprouted brown rice flour instead of breadcrumbs. When I need grain-free, I use coconut flour. Voila, wonderful patties no matter what! Made with coconut flour, these patties are a Trim Healthy Mama S. Makes 10 patties. In a medium mixing bowl, whisk eggs with flour (use the minimum amount for now), salt, pepper, and dill. Break up the salmon chunks with a fork or wooden spoon. Let sit for 10 minutes so the flour can absorb the liquid. If using coconut flour, give it at least another 10 minutes to absorb liquid before assessing again. It is okay for it to be a bit soupy. Heat (2) 10" to 12" cast iron skillets over medium high heat with 1 to 2 tablespoons of butter in each. When the butter is melted and skillets are hot, drop the batter in by heaping 1/3 cup and use the underside of the measuring cup to flatten into a pattie. Fry each side of each pattie until golden. Then transfer to baking tray(s) -- I need 2 for this recipe. Repeat for any remaining patties. Put baking trays in oven and bake patties for 20 minutes. 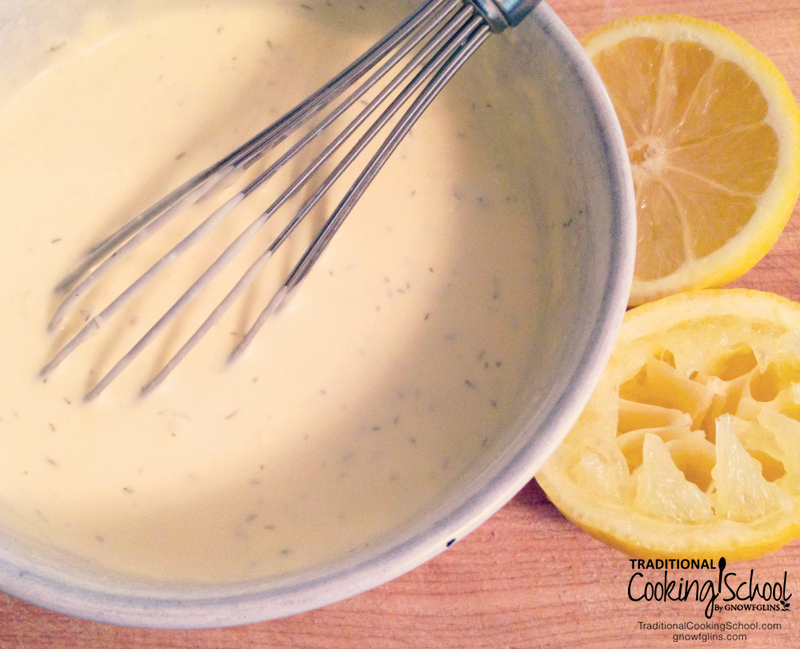 When serving, top with sour cream or homemade tartar sauce, or my favorite is the easy Lemon Sour Cream below. 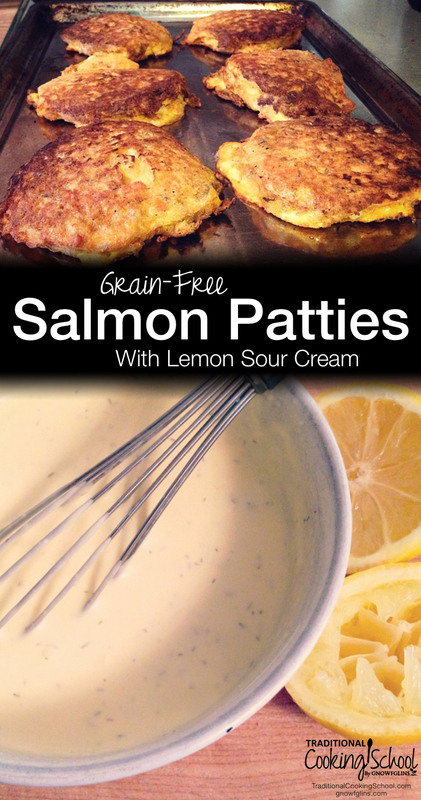 My favorite for topping salmon patties! Makes 1 cup. Whisk well and serve with salmon patties. Refrigerate leftover sauce in an airtight container. *Sometimes I use skimmed "sour" cream from the top of my homemade yogurt. Have you had grain-free salmon patties before? What's your favorite way to eat salmon? Has anyone tried the canned salmon at Costco? Or know how it compares, or if it tastes good? Thanks for this recipe Wardee! Glad you also found Vital Choice. Their seafood is the very best! No comparison to any other source. Hi Wardee, These do sound delicious. Have you every tried them with fresh salt water fish. My husband goes fishing a couple of times a week and brings home fresh fish which we usually fillet and fry however this sounds as if it might be good to try rather than just frying them. Do you think I need to cook the fish first before adding it to the batter? Gail – Yes, I have made salmon patties from fresh salmon and it’s very good. 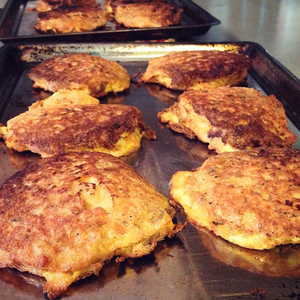 I do cook the salmon first — well, actually, I make the patties from leftover cooked salmon. I have not tried the other way but because it will flake more easily when cooked, I think that would be best. Enjoy! Hi Wardee – My question is on the smell while cooking. Canned salmon tends to be rather odoriferous in the house and even on the plate. I’m selective in cooking fresh salmon and refrain completely from using canned salmon anymore because it’s just too overwhelming to my family’s senses. I’ve had to cut back on tuna recipes as well. Thanks for the blog! You’re terrific. To be honest I looked at this for the recipe on the lemon sour cream, which looks delicious, as we do our own salmon patty recipe (no bread crumbs) but had the following question…WHY in the heck would you choose a ‘water packed’ salmon in a can? Given the issues with tin cans (BPH) and water sources, chlorine and such…as most large packers use, would you do this when there are other choices? You make a good point, Vic B. So your recipe calls for fresh, cooked salmon? Leftover salmon? Fresh uncooked salmon? Smoked salmon? Would love to see how you do yours. That might lessen my smell problem. We use leftover fresh caught cooked salmon. My other-half fishes as a hobby. Ingredients: cooked salmon, cooked quinoa, eggs, fresh parsley, green onions, brown mustard and mayo. SO I made these last night. I used the canned salmon from Costco which came in 6 oz. cans…so I used 5 instead of 4. They ended up being super dry. =( Wondering where I went wrong….Maybe the quality salmon/having a little more salmon than called for? Yes, I have eaten the wild salmon from Costco (canned). It’s very good. I make Salmon salad with it at work all the time, to get those good Omegas! Hi Wardee — Do you think these would freeze well?